just throw them in the sandwich press and you're done! The last time I did a survey on facebook there was a tie between mid-week meals with mince (which I popped up my beef pastie recipe for) and lunch ideas. 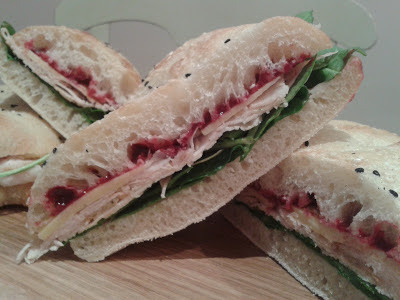 So this week I thought I'd bring you Turkey Cranberry Melts - which is an easy lunch idea that will taste just as good as if you grabbed it at your local cafe. 4 slices of your choice of cheese - swiss is amazing with this just as an hint! You can also mix this up with a little bit of ham or bacon, and other salad items - pretty much make it what YOU want to eat! You can also mix it up with chicken and avo (just take out the cranberry of course). Once lunch time comes around simply zap the melt in the mircrowave for around 40 secs before finishing it off in the sandwich press. You don't have to use the microwave but I just find that this way the spinach cooks a little better, and you don't have to have it in the press as long as well - leaving you with more a soft melt than a really, really toasty one. P.S. Just had this for lunch today - awesome.